Brand new from Dakota, this beautiful saddle is built on a flex tree, available in regular or wide bars. By popular request, this trail model is paired with barrel style skirts, making it ideal for all horses, including those with shorter backs. The seat is black perforated grainout and the leather is their popular pro brown with petal border tooling. And the fenders are soft and pliable for that ready-to-ride feel that will keep your knees and ankles feeling good! 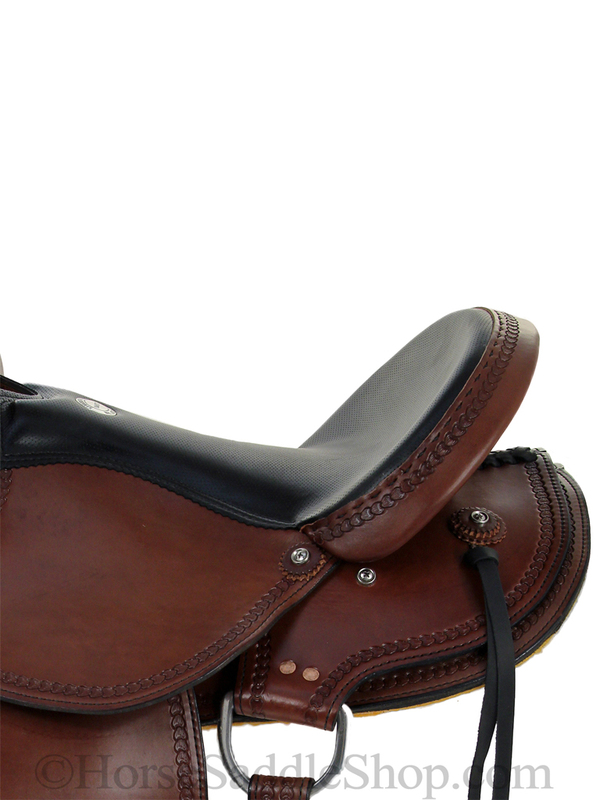 Seat Size: 15", 16", or 17"
* Full flank set included - Our Dakota flank sets include the connector strap to secure the flank to the front cinch. Nice Saddle! 5 I had this saddle customized.... talked to Josh and he helped me. Had short fenders put on, double padded seat, and a few other things. I highly recommended getting it customized for you. Even though I paid a little more, I wouldn't change it for anything. Love my new saddle! Fits my hard to fit FQH perfectly! 5 I tried many saddles and spent months researching to find a saddle that would fit me and my round, low withered, 14 hh foundation quarter horse. Dakota was great about customizing my saddle for me at nominal extra cost. I needed a 14 inch seat with full quarter horse bars. It was impossible to find that combination. I got extra padding in the seat and suede instead of smooth leather. I needed fenders for a 30" inseam and had them preturned. I used a broomstick in the stirrups and they broke in quickly. I was able to find a bridle with matching tooling at my local farm store. I use it for trail riding and schooling. I've spent many hours on the trail in this saddle and both of us stayed comfortable the whole time. I'm sold on Dakota for the quality, comfort, and value! I've now been using it on my very high withered TWH with a totally different conformation from my QH and it fits him too with an even sweat pattern. 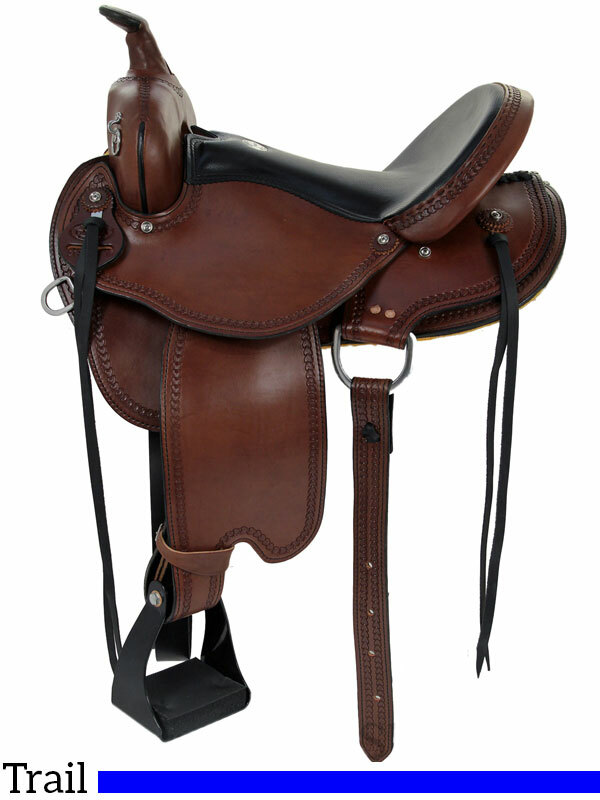 16inch 213 Dakota Flex Tree Trail Saddle Pro Brown 3 Pommel/Swells color does not match! Bare leather not stained or edged. Shotty stitching behind cantle. see Pics Attached to review, decide for yourself? Do you e=really want to pay over $1,000 for this kind of workmanship. Worst of all this was a custom order and non returnable etc. I sent Saddle Shop an email outlining the issues and all I got back was "Thanks for Your Feedback? I own a tack business with my own line of Mule Tack and I would never let one of my items go out looking like Dakota Saddlery did! At last! I've found a western saddle that we love! 5 I have a very short backed pony that I have had a terrible time with fitting, so I switched to riding in an English saddle, however I missed riding western. This saddle is very well made, and not only fits my main riding pony like a glove, but also EVERY other horse in our herd of 10! I have also purchased a 5 star pad that goes great with it. I highly recommend this saddle! Very happy! 5 I trail ride and take lessons. I have a very hard to fit mare and was able to get this saddle with the size tree I needed for $50 extra. I consider this a very reasonable price. If anyone needs a saddle with flatter bars for a wide barrel of a horse, I got the Steele AW tree. I was a little nervous because you can't return it if you custom order a tree, but I had a saddle fitter tell me what I needed. It's a little squeaky, but nothing horrible. The fenders are a bit stiff, but no worse than any other saddle I've had to break in. I haven't even oiled them yet, and they are tolerable. The seat is comfortable and I like the position of the stirrups-no horrible chair seat. I ride a spooky mare and feel secure in this saddle. I also like the rounded skirt and the price. Horsesaddleshop was easy to work with via the online chat and over the phone. Because of the different tree, it took 10 weeks to get, which was what I was told in the beginning. I'm a happy customer! 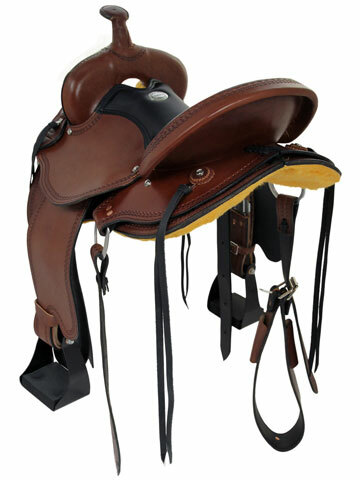 Beautiful Saddle and Timely Delivery 4 the saddle is exactly as described and is very comfortable. I have a very hard to fit paint and I was nervous ordering on line, but with the saddle fit guide and my own knowledge especially after trying over 15 different saddles until I finally figured out his fit, we got a saddle that fits him. He is happy and I am happy. And as a plus it is very comfortable. Nice Saddle 5 Took a while before I had time to use this saddle. It came exactly as promised and it is very comfortable! Felt broke in the first day I rode in it. Best Saddle I have ever owned! 5 I use this on my wide mutton withered Morgan, for trail riding. It is absolutely beautifully crafted with amazing leather and detail. It is the best saddle I have seen for the price. Soooo in love with it. very pleased with my Dakota Trail saddle 5 I use it for my riding lessons, this saddle allows me to find my correct center but still leaves me feeling secure. 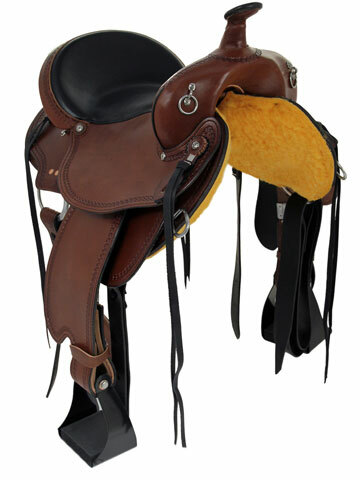 My trainer recommended this saddle and I am very happy after trying many other styles and makes. The best value for my money. The service was good, I asked for a black rough out seat and got it no problems. I trail ride often as well and love its comfort. I do like the wide stirrups. great trail saddle 5 i use this saddle on trail rides. i was sick of having such a big, heavy saddle that i needed my husband to put it on my horse, but this saddle is light enough to let me do it myself. it seems to be well made and will last. Awwww moment 5 This is the first saddle out of the many I have tried that fit me and Class perfect the first time. Sat down in it and had a AWWWWW moment. The guys at Horsesaddle shop are great too!! great for a stocky quarter type horse 5 I was nervous about buying a saddle online but I had a great experience. No problems with the order or delivery. It is REALLY comfy for both me and my wide bodied APHA mare. Everyone said you had to oil it right away so that worried me but no problems for me at all. Its already broken in and no squeaks after just about 10 rides or so on the trail. I really love this saddle and it seems much more expensive that it actually cost!! Love it! 5 I love my new saddle. I have an extra wide withered, short backed, round gelding and have had a hard time fitting him with a saddle. HorseSaddleshop.com will modify almost any saddle and I chose this one. I didn't want a flex tree, instead I chose a wood extra wide tree. It fits my guy perfectly. I was able to get it mahogany in color to match my current tack and chose black strings, flank set and strap. I ordered the preassembly oiling, glad I did because it still is a bit stiff, time will loosen the leather though. I wish I had gotten extra padding put in the seat, but it's still comfortable. It arrived within 2 months, I live in Alaska so it took a little longer, but still free shipping which is huge for Alaskans. It's so pretty I almost hate to use it. I love my new saddle! Fabulous saddle at a fabulous price!! 5 I am so impressed with this saddle! It is much more beautiful in-person and very well-made. It fits my horse very well with no pinching or rubbing and I don't use an expensive pad either. Everyone asks me about my saddle and where I got it. It just stands out so well. I do some arena work in this saddle, but mostly trail riding. Keep in mind with ANY DAKOTA SADDLE, you can SEMI-CUSTOMIZE IT. Just ask Horse Saddle Shop, they'll help you with anything. 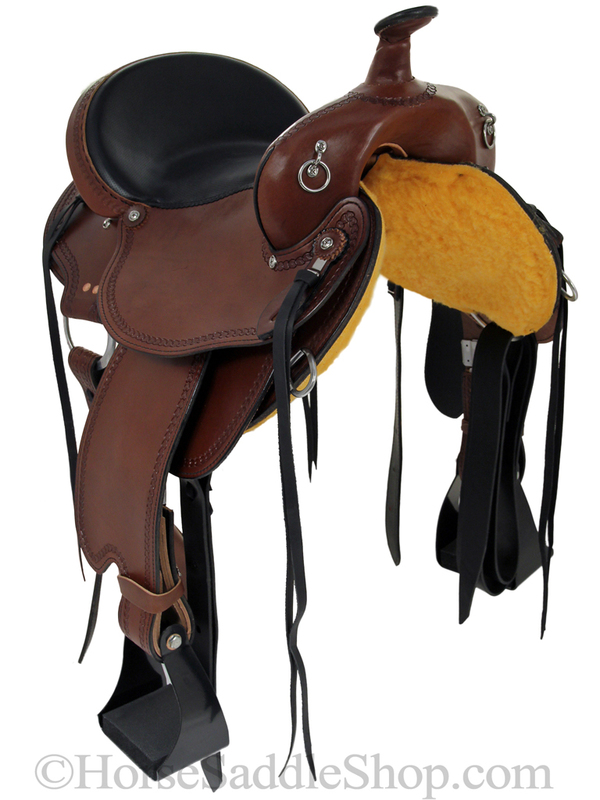 I ordered mine with different stirrups, a different seat leather, different color skirt leather, and different color saddle strings, latigo, and off-billet. NO EXTRA CHARGE EITHER. Ask another American saddle maker to change their saddle at no cost, I bet they won't do it. : It does need to be oiled right away and will require some break-in time. A broomstick in the stirrups works great. I cannot say enough good things about this saddle and I can honestly say I would buy another Dakota Saddle over the more pricey brands any day. Love this saddle 5 I got this saddle on Christmas morning and just about cried. This is a beautiful, well made saddle. I love this particular tooling style and the endurance stirrups are great. Every saddle we own is a Dakota saddle, but this one is plum amazing. It fits my TWH who needs a wide tree perfectly. He moves freely underneath it. He loves to gallop and the saddle does not interfere with his shoulders at all. The only thing I am not impressed with is that the saddle has no marking on it anywhere that it is a Dakota saddle. It says it came from Horse Saddle Shop, which is great, but I don't see anywhere the brand Dakota. Besides that one minor flaw, I love this saddle and Dapper does too. I've ridden in a Tucker saddle, but I actually prefer this Dakota saddle to the Tucker saddles. Just a personal preference. I LOVE this saddle and it is well priced. Great Saddle. Great Price. 5 Great saddle at a great price. Sturdy, well made and comfortable for both rider and horse. Ordered wide tree for larger Foundation Quarter horse and he's very happy under saddle. Feels free in shoulders to do whatever I ask. Have spent up to 5 hours out at a time with no soreness for either of us. Only dislike was the wide endurance stirup but I simply changed them out to my old ones.